Triple position can be used to help you step back from your own mental map to get distance from emotionally charged representations. You can also use the process to create empathy and even learn new things by getting valuable insights into another person’s map of the world. Have you ever had an experience that particularly aggravated you or annoyed you long after the event occurred? Attached to this experience would be some feelings in your body and perhaps some internally generated images and sounds connected with the event. You may have realised you needed to change state and move on but somehow you were continually sucked into the representations. The same process can and does occur for highly positive experiences the feelings, internal images and sounds of holidays, concerts etc can hold a state in you long after the event. In NLP when you are fully in an experience we call it ‘first position’. Have you ever found yourself walking, talking and using similar body posture and gestures to another person, that in one sense you became just like this person? Have you ever learned something new by acting as if you were a person whom you know embodies the skill you are learning? In your mind’s eye you became the other person or saying it another way you associated to their filters and map. Young children learn this way by mimicking the people around them. Actors also step into the shoes of another person when playing their role. In NLP we refer to associating to another person’s map and assuming their perspective as ‘second position’. Do you ever mentally step back during an interaction and get a sense that you can see and hear yourself and the person or people you are interacting with? Almost as though you are watching events unfold on a cinema screen or theatre stage, and you yourself as a character in the scene? In NLP we refer to the stepping back and being able to observe yourself as a person outside of you as ‘third position’. Human beings do not operate in the real world, they operate in maps of the world. 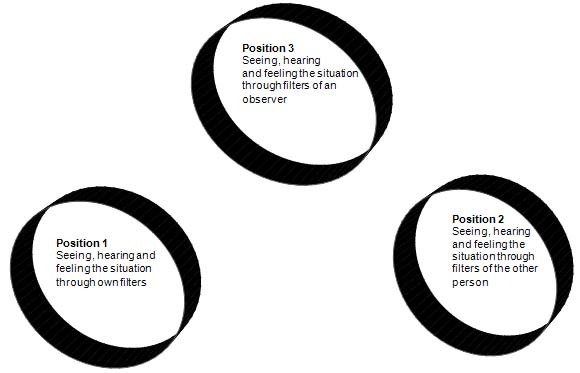 First, second and third positions are where you experience different forms of representations that map a situation from different perspectives. In NLP exploring a situation from first, second and third position is sometimes called ‘triple description’ or ‘perceptual positions’. First position is your everyday experience for any event. In first you are totally associated to the experience and seeing and hearing the world through your own filters. First is your personal experience undiluted from objectivity and undiluted from another’s perspective. High performance sports, intense levels of focus and problem states are strong examples of firsts. Your life experiences are a series of historic first positions. The more you sense your body, its tactile awareness and inner sensations, the purer the first position. Some people find experiencing their body in a ‘pure first’ a challenge. Their natural way of experiencing the world is somewhat dissociated from first position. They spend most of their time in an implied ‘third’ where they have stepped out of direct experience. These people generally will not experience the sensations attached to being in a powerful positive state on the other hand they will not experience the sensations of challenging states. On the other hand some people are very good at accessing and staying in first position. They do experience the body sensations attached to powerful positive states. Such people find it a challenge to step back from the strong feelings associated to unresourceful states. Second position is where you assume the perceptual position of another person. Impressionists are an obvious example of people who can do an excellent second position. Good salespeople, negotiators and therapists are usually highly effective at second position. They call this process seeing and hearing the world through eyes and ears of another. They do this either to create empathy or to sense how the other person builds their map. On the other hand some people overdo second position in their relationships. These people make decisions about their own behaviour through the filters (second position) of their partner. Co-dependency in relationships is an extreme example of a continual second position. Second position is the position for learning and modelling. When modelling from a state of not knowing you step into the shoes of an expert. You assume similar posture and movements. From what we now know from neuro-science, you are activating mirror neurons in your nervous system that are behaviourally dormant in you but have the same function as the neurons that are active in the expert. The second position accelerates and deepens the learning process. You may be very surprised with the hunches and intuitions you get when you do the second position exercise above. At the end of the experience make sure you resume to clean first experiencing the world as you normally do. Third is where you assume an objective observer position. In third you see and hear yourself and others outside of you as if on a cinema screen. Third position is useful if when you want to shift from emotionally charged experiences to get an objective view. Third is also useful for stepping back and getting insights into situations and seeing and hearing the bigger picture. You would assume a third to get your conscious mind learnings after conducting a ‘second position’ exercise where you have stepped into the strong feelings. Third position has a different type of feelings associated with it than first. Overall, the feelings are more objective and neutral than those experienced in first position. Some people tend to spend a lot of their day in third, and not experiencing the emotions the strong feelings are associated with first. Third position is very useful for assuming the role of being your own coach. 1. Immediately after an activity, physically move to a position where you have a clear view of the space where you were performing the activity. Assume an upright posture with straight spine, shoulders back. From memory, imagine you are watching yourself in the activity in the performance space. This is third position, and a space where you can offer objective feedback. Be very clear about the sensations you experience in first and how they support you or perhaps limit you. If you need more objectivity in a given situation, step to an analytical third position. If you are over analysing, step to experiential first. If you would like more empathy with another step to second position and see and hear from another’s perspective. If you seek to learn quickly use second position and associate to the perspective an expert. Most importantly increase the number of choices available to you in your life by becoming highly flexible with your use of triple position.